Today’s recipe is for banana cream pie, the ultimate weapon if you ever find yourself in a food fight. Bananas are off limits on a low carb diet, but this recipe only uses banana extract so it’s perfectly above board. I was amazed at how close the taste was to actual ripe bananas. It tastes just like the real thing, but with a fraction of the carbs. The banana cream filling is made from coconut milk, egg yolks and cream cheese with whipped cream folded in. It’s got a nut flour crumble crust and is topped with even more whipped cream. The result is an extremely decadent dessert with only 7g net carbs per slice. So while it may be very satisfying to hit someone in the face with a banana cream pie, please try and refrain. This pie is far too delicious to waste. This is the perfect weapon if you ever find yourself in a pie fight. 1. Separate the eggs from the yolks and beat the yolks slightly. Heat the coconut milk in a medium sized sauce pan over medium heat. You want the coconut milk to be hot but not boiling. 2. Slowly beat 1/4 cup of the hot coconut milk into the eggs to temper them. Return the yolk mixture to the sauce pan and lower the heat to Low. 3. 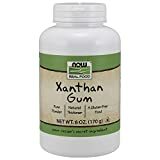 Mix the sweetener and Xanthan Gum together in a small bowl. Sprinkle over the coconut milk mixture and mix in. 4. Cook for 3-4 minutes, stirring constantly, until thickened. 5. Remove from heat and stir in banana and vanilla extracts. 6. Add to a medium sized bowl and cover with plastic wrap so that a skin doesn’t form. Chill in the refrigerator for at least 2 hours. Test to make sure that it is cold all the way through. 7. Right after the filling goes into the fridge, you should make up the crust. 8. Preheat the oven to 350 degrees F and spray a pie pan with cooking spray. 9. Mix the dry ingredients together in a large bowl. Add in the melted butter and mix until a crumble crust forms. 10. Press the crust into the pie pan with your fingers until it is evenly distributed. Poke holes into the bottom of the crust with a fork. 11. Bake for 10 minutes until browned around the edges. Allow to cool on the countertop as you wait for the filling to chill. 12. Pour one tablespoon cold water in a small bowl and sprinkle gelatin on top to soften it. After 2 minutes, stir in 1 tablespoon hot water until all gelatin has fully dissolved. Use a spoon to shmoosh any clumps against the side of the bowl until the mixture is uniform with no clumps. 13. Using an electric mixer, whip the heavy cream with 1 teaspoon vanilla extract and 3 tablespoons powdered sweetener until soft peaks form. Slowly pour in dissolved gelatin mixture and beat until stiff. 14. In large bowl, beat cream cheese until light and fluffy. Slowly beat in the chilled banana pudding, a little at a time. Add in few drops of yellow food coloring, if it doesn’t look yellow enough. 15. Fold half the whipped cream into the cream cheese pudding mixture. 16. Spread filling into the cooled crust. Top with the remaining whipped cream. 17. Chill in the refrigerator for at least 3 hours before serving. If you liked this recipe for low carb pie, then you might like my recipes for Strawberry, Chocolate Silk or Snickers Pie. This pie is absolutely fabulous. I will definitely make this again. My husband loved it.